Now men look and feel their BEST! The Delhi Gentleman can now be sure of the experts in town, who bring in sophistication and finest grooming through their world class services and unmatched product quality. 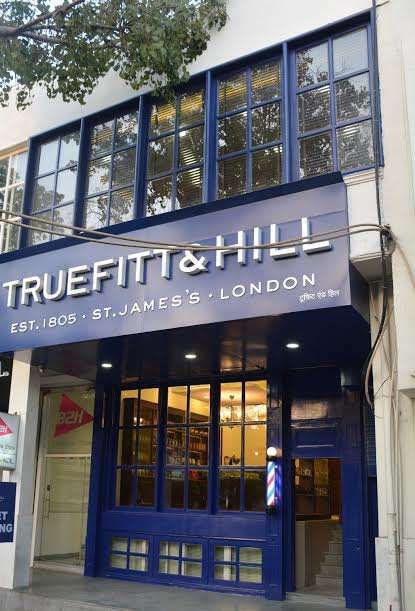 World renown barber shop – Truefitt and Hill is opening in Delhi, at Meherchand Market, Lodhi colony on 30th March 2016, marking its first ever outlet in the capital city. Truefitt and Hill could not have timed their foray into India any better as more and more men are looking into Grooming as a necessity now. Brought to India by the Lloyds Luxuries Ltd., which has acquired the Master Franchise License for not just India but also Nepal, Bangladesh, Sri Lanka, Bhutan, Myanmar and Vietnam, the venture looks promising. Started by Mr. Krishna Gupta & Mr. Istayak Ansari in 2013, Lloyds Luxuries Ltd aims at creating an atmosphere of total relaxation and ultimate comfort for their male guests. Through this, they wish to encourage grooming for men greatness. The outlet at Meherchand market is spread over 2 floors, with 2 Royal suites and 5 Barber chairs, located at one of the prominent market places in the city. Offering a ​quintessential feel with its classy interiors ​in mahogany wood adding chic blue wallpaper creating a contrast, makes for a complete relaxing environment. The brand’s next big outlet is going to open up at, Ameya One mall, Gurgaon by mid-March. So keep watching this space for more! The prestigious history of Truefitt & Hill began in 1805 during the reign of H.M. King George III. Since then, the clientele have included members of the male like of the Royal Family, as well as members of visiting Royal households. Their barbers hold Royal Warrant to H.R.H., The Duke of Edinburgh. It has provided discerning gentleman with the finest grooming products and services. The elite clientele also include the Business leaders, Members of Parliament, Ambassadors and Diplomats and visiting Dignitaries. Oscar Wilde, Charles Dickens, Lord Byron, Frank Sinatra, Winston Churchill, Alfred Hitchcock and Laurence Olivier are few of their renowned clients. Apart from London T&H, they now have the luxe barber shop in London, Chicago, Toronto, Beijing, Kuala Lumpur, Singapore, Bangkok, Baku. Superior and distinct services offered by Truefitt and Hill are The Royal Shave and Haircut, Classic Shave and Haircut, other hair treatments, Royal manicure & pedicure, head massage, facials, etc. and offer complimentary valet service, wi-fi, refreshments with every visit. They also have an exclusive VIP Room called Dukes’ Den for that special engagement, business meeting, or simply just to relax and unwind! Truefitt & Hill offers grooming products which includes exclusive pre-shave oil, shaving cream, colognes & aftershaves, bath and body products, shampoo and conditioner, shavings kits etc. They also retail exclusive hand-crafted leather accessories, Deakin & Francis cuff-links, Barker shoes from well renowned company from England, Cirrus Bar accessory and Cigar & Cigar accessories from Dominican Republic & Cuba exclusively available in Truefitt & Hill India.